Bumper Stickers are made for outdoor use as they are weatherproof and UV resistant. If you are after a sticker that needs to last up to 5 years in outdoor conditions, then our outdoor options are ideal. They are printed on premium white vinyl stock, available in a gloss or matte finish. Perfect for cars, trucks, windows, tool boxes, service stickers and outdoor equipment. Suitable for cars, trucks, windows, tool boxes, service stickers, outdoor equipment. For larger quantities, or if you don’t see what you want here, please contact us or fill in the free quote form. Need a different size, quantity or shape? No problem! Contact us for a FAST quote. Once you order from eStickers.com.au, you will get an endless array of colours at a very low cost. Would you like some design ideas? No worries – you simply tell us what you want and we’ll incorporate it at no additional cost. All your stickers will be printed in photography quality. These stickers are 150 line screen which means that quality is picture perfect. It is in your best interest to stay away from manufacturers using a pixelated or grainy 70 line screen process which means that your stickers will look blurry and unprofessional. 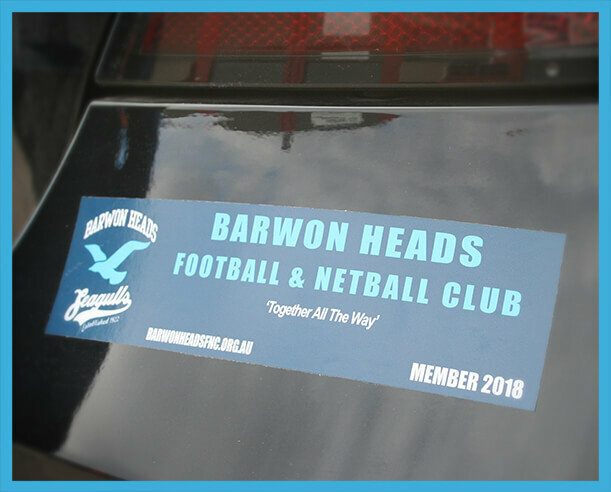 For added strength and durability, our custom made bumper stickers are manufactured with premium-grade white vinyl material. Our expert team makes use of the best printing methods so that your stickers are weather proof and UV resistant so that your stickers will simply look great for years to come. All without cracking, peeling, fading or bubbling. Your products need to look amazing, but you may not have an artwork design. We will help you to design the perfect sticker free of charge. If you have a logo or idea in mind, let us know and we will help you come up with a fantastic design. As we strive to supply you with environmentally friendly inks and premium materials coupled with an endless array of colours, in any shape or size, you may think it will cost you extra to get your stickers. Not at all – all these features are included for the one price. How is this possible? We specialise in selling stickers only. We do not sell other products such as business cards, fridge magnets, brochures or flyers. We only print stickers and that is why we are the sticker printing experts. We purchase our stock in bulk, then divide any additional overheads between our numerous customers and pass the savings onto you. This way we are able to offer exceptional value including no cost artwork without compromising on quality.